On the northern end of the Alaska Peninsula, there's a place with a moonscape caused by a cataclysmic volcanic eruption. There's a place where sockeye salmon decorate streams with their ruby red bodies during the spawn. There's a place where brown bears out number people. 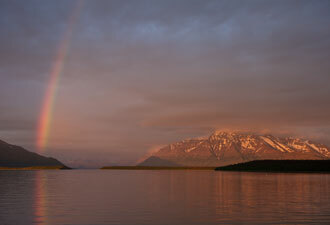 This same place has been a home to humans for 9,000 years: Katmai National Park and Preserve. Here you can explore the Valley of Ten Thousand Smokes, a 46-square-mile area created during the largest volcanic eruption of the 20th century. On June 6, 2012, Novarupta Volcano violently exploded. Over the next 60 hours, pyroclastic flows and surges buried a glacially-carved valley with ash and pumice, and ash darkened the skies over Kodiak for three days. Today, the landscape offers insights into the sudden changes caused by volcanic eruptions and well as the landscape's potential for renewal. A ranger-led bus tour departs from Brooks Camp to the Valley every day in summer (in 2013 that's June 7 through September 16). 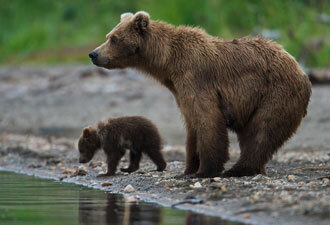 The beginning and end of a salmon's journey takes place in Katmai. Born in gravel nests in mid-winter, sockeye salmon fry spend one to two years in Katmai's lakes before they become smolt and migrate to the sea. After two to three years in the ocean, sockeye salmon reverse the migration back to their natal streams to spawn. Faced with predators and disease throughout their lives, they face nearly insurmountable odds. A few are successful in their journey, reach their spawning site, mate, and die. A salmon's journey offers an incredible example of the drive to reproduce. More bears than people inhabit the Katmai region. Here you can watch brown bears congregating and competing with one another for the land's bounty. Abundant food, like salmon, allows Katmai's landscape to support some of the highest densities of brown bears on Earth. The Brooks River, for example, is world famous for its bear-watching opportunities. If you can't make it to the park, the next best thing is viewing the Brooks Camp Bearcams from the comfort of home. However you experience it, the drama and excitement of bears “fishing” for salmon is an unforgettable experience. Because of Katmai's natural abundance, it has been home to many cultures for thousands of years. Join a ranger for the Cultural Walk to learn about the rich human history of Katmai and the Alaska Peninsula. This 45-minute program starts every day in summer at the Brooks Camp Visitor Center. If you enjoy fishing, Katmai's lakes and streams offer wonderful sportfishing opportunities for rainbow trout, arctic grayling, arctic char, and salmon. 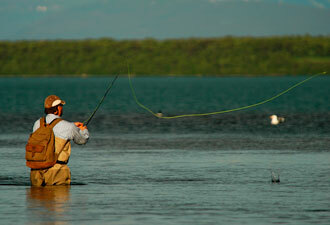 Rainbow trout can grow to more than 30 inches in length! Many people consider Katmai's remoteness to be an attractive characteristic, but the remote nature of the area requires careful planning to overcome logistical and accessibility challenges. Unlike most national parks in the United States, Katmai is accessed almost exclusively by plane or boat. Much of the area is rarely visited, and opportunities for incredible wilderness experiences abound. Other areas, such as Brooks Camp, are more easily accessed and have amenities like lodging and hot meals. These parklands are open year-round for the adventurous. Numerous companies—more than 115 in and around Alagnak, Aniakchak, and Katmai—provide a variety of commercial visitor services, including transportation, guided day trips, guided multi-day trips, overnight accommodations and food services.